NetEnt has released the official lunch date of its new Finn and the Swirly Spin slot and pre-warns players well in advance to get ready to be swirled around by the Irish theme from the 23rd of November 2017. The unique new Finn and the Swirly Spin Slot features a unique Spiral Spin mechanism and excites with a bouquet of special features improving winning opportunities while up to 50,000 coins are bound to turn heads. Exquisitely crafted symbols such as ruby red diamonds, golden acorns, lucky horseshoes, green four leave clovers and wood shaped into high card symbols can be combined to enjoy payouts worth up to 500 coins. Earth-shakenly good wins are boosted via key collecting and the total number of keys displayed by the key meter are not reduced once the free spins game is unlocked. Excitement builds as the key makes its way to the centre to unlock the rabbit hole leading to the magical free spins world. Initially, players get to choose only one free spins option in the sky city decorated by white marshmallow clouds. More options can be unlocked once the free spins round have been activated several times to gain access to explore several sky cities including the steampunk inspired StarBar Free Spins, earth melting Lava Lair Free Spins, Irish pub-themed Lucky Mug Free Spins and exotic island themed Golden Pot Free Spins. By gaining access to the StarBar players can enjoy 7 free spins plus one key to unlock the Starfall Wilds. The leprechaun is full of surprises and throws several super special features into the swirly mix to award awe-inspiring rewards. CasinoLuck will be one of the first online operators to add the new Finn and the Swirly Spin Slot and invites players to enjoy the flight down the emerald isle to meet a magical leprechaun called Finn, eager to show players the way to phenomenal wins. 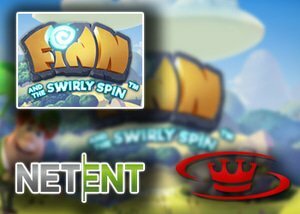 Finn and the Swirly Spin can be enjoyed via a NetEnt no deposit bonus this November. An array of fantastic promotions are available at CasinoLuck, including new players sign up offers, monthly bonuses and a brand-new VIP program..